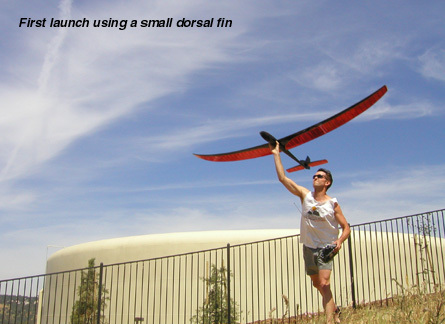 Many have talked about "Taming" the Hobie Hawk. 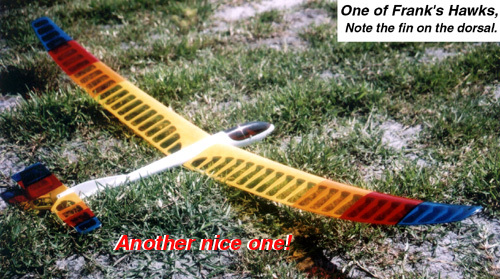 It was touted as a beginners plane when introduced, most who have flown a Hawk would disagree. With a complex wing design that does not like to be stalled and a wing incidence angle that has you flying your Hawk with a nose down attitude, the Hawk will certainly keep you on your toes! Larger RUDDER This was a good mod. 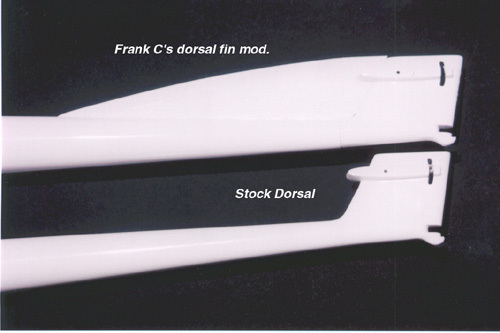 Some even cut the front tip of the rudder off and affixed it to the dorsal making a full vertical fin with a conventional straight hinge rudder. Then you would increased it's overall size. It seemed like about a 15-20% increase in rudder size did nicely from those I've talked to, even if you didn't do the fin mod. 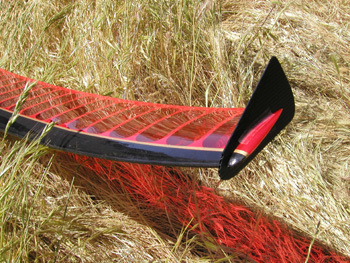 This mod also is much less intrusive on the sleek appearance of the Hobie Hawk. Dorsal Fins One of the seemingly most successful and easy to do mods was the addition of a fin above and in front of the dorsal. This adds directional stability. Does it work? Yes. 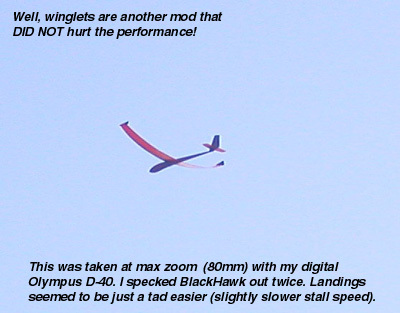 I made my own based on descriptions handed down to me and when I flew my "Black Hawk" she seemed to have much less "waggle" and just tracked more true. 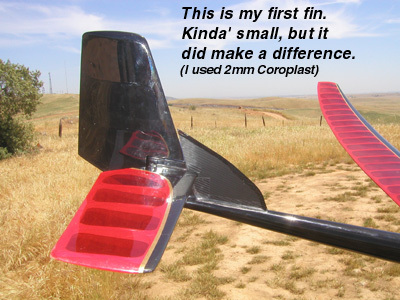 I just received a dorsal fin from Mr. Frank Cox which is much longer, but not as tall as mine. I will try Franks' design too and report back. Below are some photos of what I am talking about. 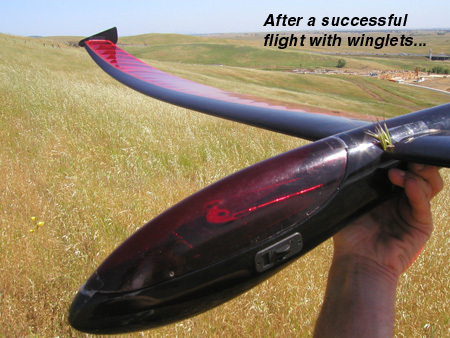 Winglets I also fly foamie combat type wings and winglets are critical. They help a bit in preventing tip stalls and in the case of the Zagi's and XR Combat wings the winglets reduce side-slip. 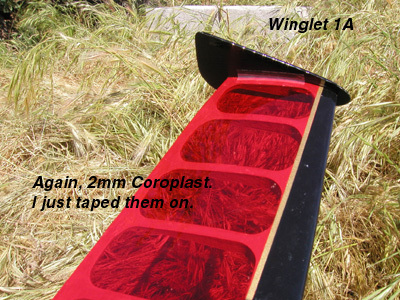 I wondered if this would help the Hobie Hawks notorious tip stalls, so I again cut up some 2mm Coroplast and strapped winglets on my BlackHawk. From what I observed, it seemed to have a slightly lower stall speed. On my next launch I snagged a thermal and when I had plenty of altitude I did some intentional stalls. 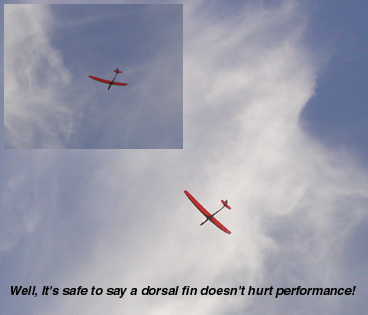 It seemed that when I would stall the Hawk it would not tip drop and try to roll as much. Of course this is all without scientific merit and the differences were subtle. I will try different shaped winglets in the future. Below are some photos of what I came up with. MORE TO BE ADDED as I continue to experiment... If YOU have any Mod's you'd like to submit, send 'em in!